In archaeology, a standard convention is the division of prehistory and history into three main ages, the Stone Age, the Bronze Age, and the Iron Age. This three-age system has been used since the nineteenth century, and as a general framework works well. Since the introduction of radiocarbon dating in the mid-twentieth centuries – which allowed for the absolute dating rather than the relative dating used previously – the three-age system has continued to be used and matched to relatively precise dates. Across Europe, and the world, different chronologies occured and researchers use different names and definitions, which match the regional or national archaeology. 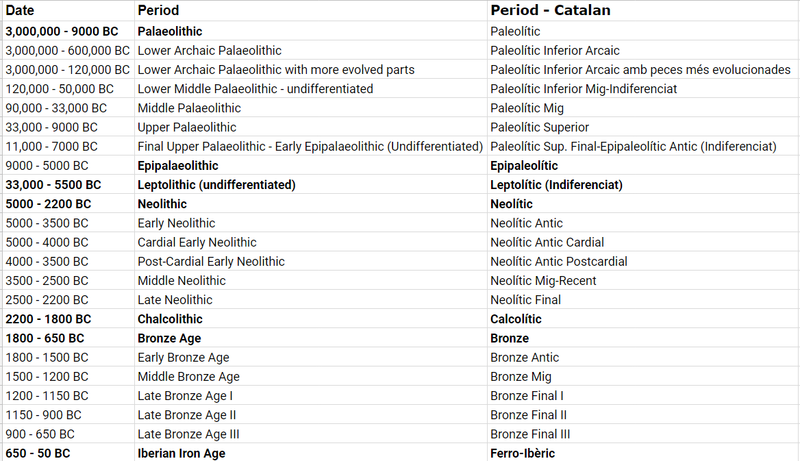 The table below provides the time periods and ages’ names & divisions used by the Inventari del Patrimoni Cultural Immoble Català (Catalan Cultural Heritage Inventory), Generalitat de Catalunya, as it relates to the archaeology of Catalonia. This provides a general resource and resource guide for the dates used in the literature on the prehistory and history of Catalonia. The dates, however, are a moveable feast, in that new sites and finds can change the upper and lower ranges, and more recent publications will use a different sequence.